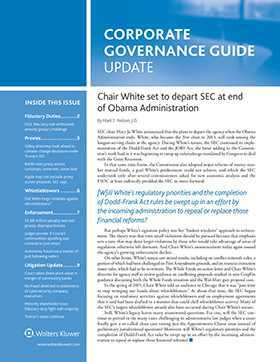 Recently relaunched as the Corporate Governance Guide Update newsletter (formerly Corporate Directions Newsletter), this semi-monthly publication is an exceptional source for staying current. The new name, along with changes to the newsletter's format and layout, signals corresponding enhancements to the content and scope of coverage. In addition to the above topics, other timely issues include SEC activities, proposals before Congress, technological developments, international practices, case studies and more. It is truly an invaluable resource for the corporate secretary and governance professional. You'll receive a storage binder and quarterly topical indexes for your Corporate Governance Guide Update newsletter, so you can refer to previous issues for a quick overview. Included with a subscription to the CCH Corporate Governance Guide (formerly Corporate Secretary's Guide). The internet version of the newsletter can also be sent via push e-mail so subscribers can receive a PDF copy delivered immediately upon publication.